Don't want Windows 10 forced upon you? You are here: Home / Blog / Operating Systems / Don’t want Windows 10 forced upon you? Don’t want Windows 10 forced upon you? So over the last few months, I’ve had Lot’s, and Lot’s and LOT’S of people have been contacting me about Windows 10 automatically being forced upon them without specifically initiating the upgrade. Well in my opinion, the word “forced” isn’t quite accurate. Somewhere along the line, the End User has “Reserved” their copy of the free Windows 10 upgrade, which has subsequently set them on a path that, along with ongoing Windows updates, lead to an apparently automated upgrade to Windows 10. Now whilst it is true that you can “Roll Back” Windows 10, there may be some consequences. The first of which is the time taken whilst the upgrade takes place, and the second is the time taken to roll it back. The other consequence is the possible loss of data. I had one customer who claimed to have lost all his Favorites. So what to do if you want to stop those Windows 10 upgrade notifications? 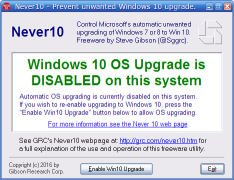 Well I have come across a free little utility called Never10. When run, it will disable the Windows 10 upgrade notifications. So if you have had enough of the persistent Windows 10 upgrade notifications, give it a try. https://www.spottydog.com.au/wp-content/uploads/2016/03/Snapshot3.png 180 234 Admin https://www.spottydog.com.au/wp-content/uploads/2013/08/[email protected] Admin2016-03-30 17:32:372017-11-09 20:59:25Don't want Windows 10 forced upon you? Great service, great advice, value for money. By subscribing to our blog, you will receive notifications of new posts by email. Worldwide Ransomware Crisis – Self Inflicted? Cyber Attacks – are you prepared? I recently had dealings with Microsoft on behalf of a customer that I can only describe as disgraceful and disappointing. The customer in question was an elderly lady with Parkinson’s disease. She had been the victim of a crypto-virus attack, and I had no alternative other than …. For the first time ever, I had a computer come in for repair that had a faulty SSD Hard Drive. They consist a fast Memory, and a controller. So this makes SSD Hard Drives super fast, and importantly to this conversation, super reliable. There are currently 3 types of USB Port. USB 2.0 & USB 3.0, both known as USB Type A, and then there is the newer USB C Type connector which is smaller. Our business requires our computer system to provide reliable, solid and simple functionality with the ability to manage and store large quantities of data on a daily basis. Our ability to process, back up and retrieve data efficiently is critical. Iain has managed our computer system requirements for as long as I can remember and provides successful outcomes every time. I needed a new PC for my family business, and I was just going to buy off the shelf at one of the big retail stores. But after talking with Spotty Dog, I decided to go with a custom built PC. As Iain explained, we had the benefit of choosing what components were used and their quality. I have been very pleased with the resulting speed and performance, not to mention the reliability. I am so glad I didn't just buy what the retailers were trying to clear off the shelf. Ian has been our computer Technician for at least 15years. He is knowledgeable and efficient at his work. We email him and get a response within 24hours. In the last 15 years we have purchased and had Ian build a number of computers for us. We have always found him to be prompt and friendly. Iain has been my go to man for some years now. He has built two computers for me and sorted out problems with two others. I have always found him to be so helpful and so willing to do more than I ask of him. I thoroughly recommend Spotty Dog Computer Services. I've been dealing with Spotty Dog Computer Services for as long as I can remember. Probably around 18 years. Iain has supplied us with several Laptops and Computers over the years, and has assisted us with any IT issues along the way. I would happily recommend him for any computer related problems. 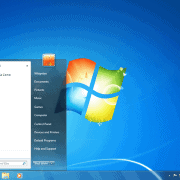 Only Windows 10 from the middle of next year Ransomware – What can you do about it?